It is my turn to show my wooly creations... I saved one from the Pin It! 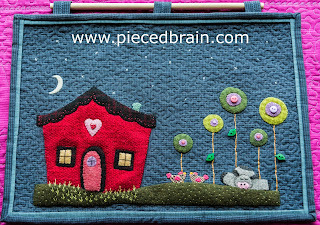 Pincushion Blog Hop hosted by Sew We Quilt a couple of weeks ago, and then designed a wall hanging. I felted an old sweater for this one. Notice the piece I added to frame the embroidery - it came from the neckline of the sweater! It is a 5.5" x 4.5" pincushion, stuffed with polyfil, so it is very light. For contrast, I made a rose using ric-rac... As with my previous pincushions, the embroidery pattern came from one of Anni Downs' books. Can you tell I am exhausted??? 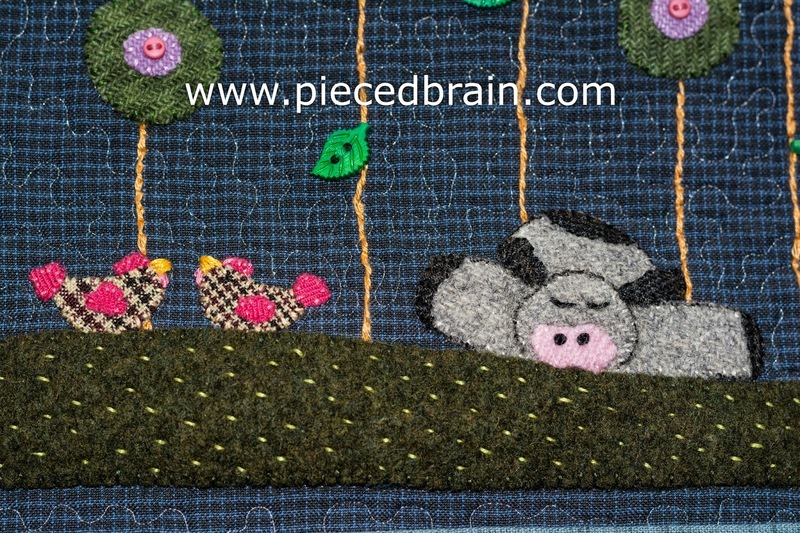 I used whip stitch to applique the wool, then embroidered stems, eyes, and all other items. The flowers feature hand dyed wool by Woolin Rouge. The background is cotton, all the other wool is upcycled (the door was made from the same sweater as the pincushion above). I had such a relaxing time embroidering (DMC floss) the grass, the roof detail, the stars... I quilted it with a small meandering motif, using monofilament (cotton in the bobbin). This wall hanging measures 16" x 11.5". 2. I have a giveaway!!! - Leave a comment on this post. - Bonus: leave me another comment telling me you are a follower, for an extra entry! This giveaway will close September 27, the last day of the hop, at 5pm. A randomly chosen winner will be announced on September 30, here at this blog. I will ship internationally, too! Have fun today, and meet me back here tomorrow for another wooly day... and a surprise guest! Fun projects Denise! I adore your cow alter-ego lol. I am a follower. Denise I just love your projects! Both are adorable. Your needlework is so cute... Isn't it fun to work with old wool sweaters and things? I have a blast going to 2nd hand shops looking for wool. Thanks for posting and hosting. The Woolin Rouge wools are to swoon over! I am partial to the Rosy Woolin Nickel Pack... Love those colors! First off I have to thank you for putting together this fun blog hop! 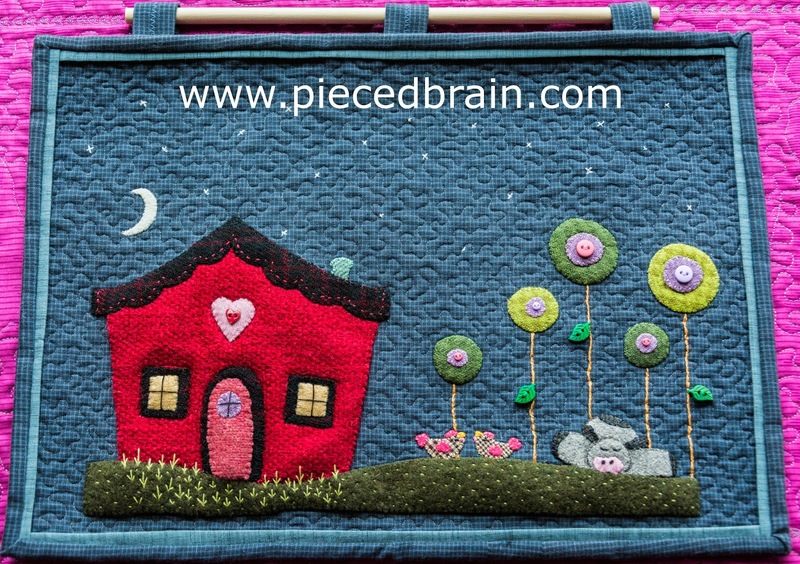 I am completely addicted to wool applique, so I was very excited to hear of this blog hop. I love your projects...especially the house with flower, and the poor little exhausted cow...lol. I love the Autumn Splendor Nickel Pack. Fall colors are definitely my favorite. What beautiful projects Denise! That Rosy Woolin Nickel Pack is so neat! I am a follower and always enjoy all the different projects you show! I am following you and I thank you for coordinating this event! I have had fun all week and have gathered lots of ideas and inspiration. Beautiful! I need to do some work with wool since I have done very little with it. I always admire wool work! Thanks for sharing. Thank you kindly for pointing me in the direction of Woolinrouge. If I win a Nickel Pack, I would prefer oranges. Thanks for a great hop Denise - it has been such fun! I like the Spring Bouquet wool pack! Ooh...the jewels pack is my favorite. Thanks for organizing! This looks so fun. I want to take the plunge with a little bit of wool that I recently bought. Thanks! And yes, of course, I'm a follower! 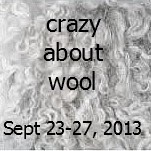 It's been fun checking out all the wool projects--totally inspiring! Lovely projects!! 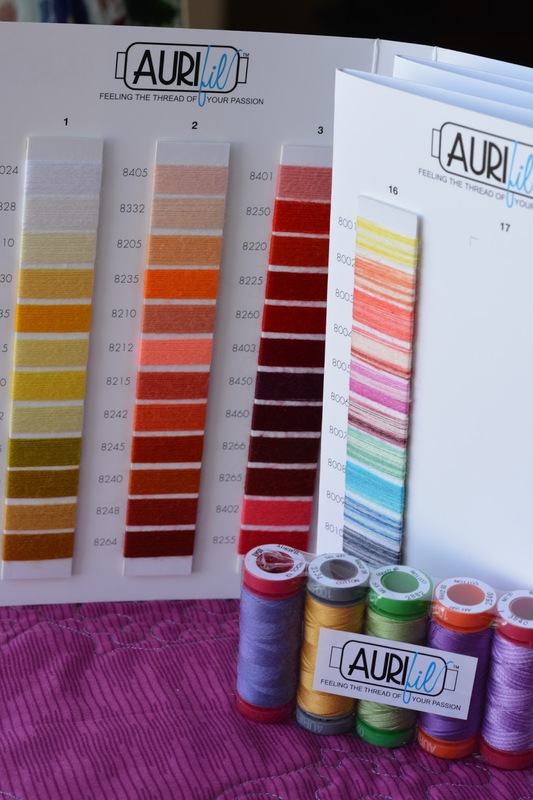 Woolin Rouge looks wonderful...OH OH...a new source of WOOL!! Love those reds...funny how I always gravitate to the reds...maybe because they seem to be the hardest to dye! Thanks for the chance to win!! Oops--forgot to mention that I'm a follower and love Autumn nickel pack! Such a cute pincushion!!! I have to see if I find some old sweaters from my son,lol! And I love your miniquilt. The cow is so cute (could be me too..)! Really lovely! Thanks so much for the give away. Those packs look great. I especially love Autumn splendor pack. Wool is so fun to work with and I have been enjoying seeing all of the projects and being inspired. Thanks for creating this hop. I love working with wool and enjoyed seeing all the projects. Great projects Denise!!! Hard to tell how large that pincushion really is, but if that's the neckline to a sweater is has to be large. Very sweet embroidery. I am a happy follower !! Cheers! Wow Denise! How clever to use up your sweater like you did! those are some really cool projects you came up with!! I hopped over the Woolen Rouge site and my favorite nickel pack is the Autumn or oranges. Very pretty colors to choose from. I am a follower of your wonderful blog, and I want to thank you for all of your hard work in putting this blog hop together for us!! What a sweet little cow. Love both of your pieces. The wall hanging is great. Oh Denise your little wall hanging is absolutely adorable , love it !! I love all the extra stitching you did , gives it such character . The pincushion is also sweet and a great use of a recycled sweater . I am a follower of your blog and thanks for the chance , if I was lucky enough to win I would love autumn splendor. really cute projects you created with wool. thanks for sharing. Thanks for the hop, it's been so fun. Love your wallhanging. The little sleeping cow is adorable. 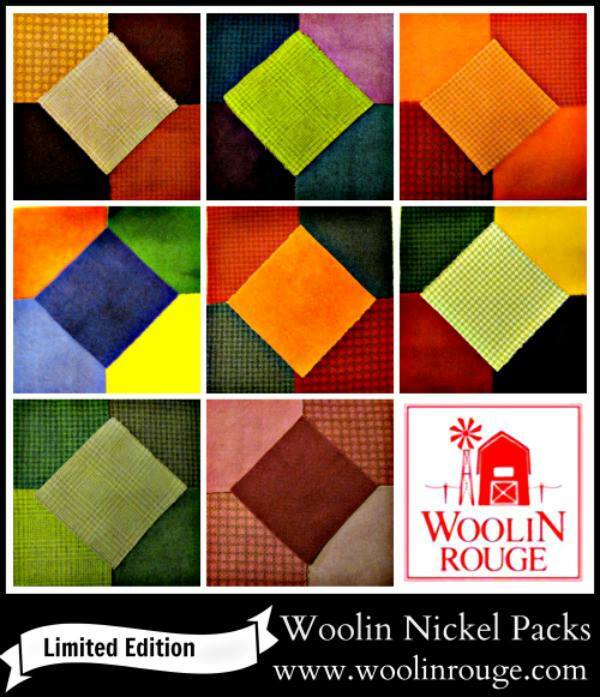 My favorite woolin nickel pack would be the oranges. I love your project it is soooo cute. I like the oranges colorway. Love your recycled sweater cushion! I am all about repurposing! Good idea to plan this wooly hop.I look forward every morning to see what woolie things I will see. I really like the Jewel woolen nickel pack. i am a follower on "bloglovin'". 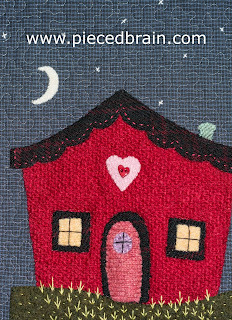 I love the house applique. How cute!! I love them all. So much fun this hop has been. Thanks so very much for hosting. Cute projects. I know much more about wool due to your blog hop. Thanks. thanks for the hop Denise, I've had so much fun!!! I'm loving the Spring Bouquet Nickel Pack....so bright and cheery....takes the sting out of summer! Im a follower too.....both on Google and Bloglovin! I love your wall hanging with the very sleepy cow! Cute pincushion too! I made a rose like that for St. Patrick's day a few years ago. I'm a follower. I like the Autumn Splendor pack. Thanks for the giveaway. How beautiful... 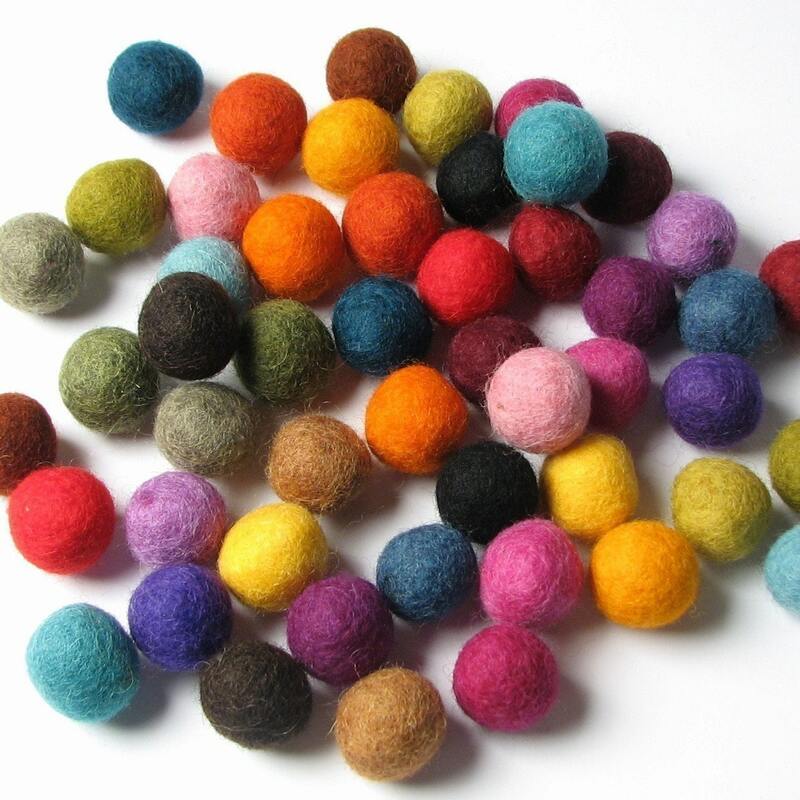 I would love to try a wool project using Jewels! Your little house is darling. Nice idea on utilizing the sweater in the piece as well. Thanks for sharing and hosting the blog hop as it was great fun! Such cute projects....love how you used the neck opening for your cute stitchery! Thanks for sharing with us and hosting this fun Hop. I am also a follower of your charming blog. Love your cute projects Denise. The cow in the wall hanging is just how I felt last night after my week at work!